We all have those days when we need to get dinner on the table in a hurry. Noxxa Pressure Cookers cook up to 70% faster so you can set it and forget it! Spend more time with your family and whip up nutritious “fast food” in no time. The longer your food sits in boiling water, the more nutrients and flavors are stripped from them. Since the Noxxa Pressure Cooker has a much shorter cooking time, your food is less likely to lose its vitamins, minerals and taste. You can also incorporate the liquid into your meal and benefit from the residual vitamins. Whether your kitchen is the size of a closet or it's filled with people all the time, using only one appliance makes life a little bit easier. Just throw all of your ingredients in the pot and then let the Noxxa Pressure Cooker work its magic. You can make special meals that you would normally save for weekends or special occasions every night of the week! Since the electric Noxxa Pressure Cooker is the only appliance you're using and it has a shorter cook time overall, that means less energy used all around. There is nothing worse than working up a sweat while you're cooking. Since the Noxxa Pressure Cooker retains heat and steam, it won't escape like it would if you were using the oven or a stovetop. This way you can enjoy your favorite dishes you used to save for the colder months all year round! As long as the lid is secure on your Noxxa Pressure Cooker, there will be no splashing, boiling over or escaping steam from your pot. Most importantly, once you're done cooking, there is only one pot to clean! One of the most unique components of a Noxxa Pressure Cooker is that it can also be used for canning. 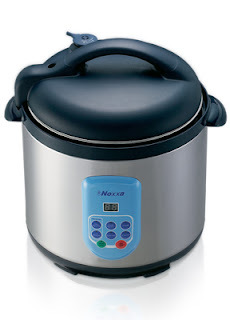 Preserve soups, meats, fish and so much more with your Noxxa Pressure Cooker. You can save money by buying cheaper cuts of meat when you're cooking with a Noxxa Pressure Cooker. It adds moisture and causes your meats to soften for a melt-in-your-mouth texture. Just because you don't have the time to cook a four-course meal doesn't mean you don't deserve to have one! You'll be eating like royalty once you start using your very own Noxxa Pressure Cooker.